Palardelphia: Carlos Santana has been on fire lately. Looking at his rolling averages…was he walking too much (and not capitalizing on hittable pitches)? Yu: Is this a breakout season for Maikel Franco? Syndergaardians of the Galaxy: Can you say anything that will make me feel hopeful about the Mets? Jack: Should the Jays just bite the bullet and give Morales the remaining $20 million or so on his contract to go away? He looks finished, and the roster is actually pretty crowded when/if it gets healthy, and they could use that DH spot to keep guys like Solarte and Hernandez’s bat in the lineup. And obviously Morales’s lack of speed and defense makes him a pretty useless bench player. Rox Fan: Is it time for the Rockies’ rotation to sue the offense for non-support? Nathan: Why aren’t we talking about how good Leonys Martin has been? Should we be talking about how good Leonys Martin has been? THE Average Sports Fan: Is Eric Hosmer the final product of a secret government program aimed at driving all writers at Fangraphs insane? Kiermaier’s Piercing Green Eyes: Is Sergio Romo finished? So many walks and hard hit balls when the Rays have a small army of AAAA or better guys in Durham. Or given his career-high K numbers, maybe they think he can turn it around enough to be flipped for a low-end prospect? Todd: Anything jump out at you about former Top-100 prospect Alen Hanson in SF? Any chance for him to be a regular ML player? Johnny Triple: Eddie Rosario’s launch angle has increased to 20.2 this season from 12.7 last season. Is this the type of thing that can be sustained or is he a regression candidate for the rest of the season? Haven’t heard anything about a swing change. Yu: Is Andrew Heaney actually pretty good? Vicente Padilla: What’s a good baseball pun name for a new kitten? Orioles fan: Can you give us anything to be happy about or look forward to other than the returns we’re going to get for Machado and maybe Britton? Gest : Were you able to see any of Gohara’s appearance last night? Just from looking at the play-by-play, it didn’t seem like his slider was fooling anyone. Deathclaw: Is Nomar Mazara breaking out? He has greatly improved against lefties and is also hitting the ball significantly harder. Or just a hot streak? Kevin: Jeff, just wanted to say I’m a huge fan and that I hope you have a fantastic weekend! jimmy: Devon Travis has a wRC+ of 7 in AAA. Is he cooked? Blessed Be the Chatters: Should the White Sox ask Matt Davidson to use a glove at Wrigley this weekend? Particularly, not of the batting variety? Ross: Who are you most concerned about, the Indians, Cubs or Dodgers? Put on your tinfoil hats! : At the beginning of the 2016 season, MLB announced that they were switching their official pizza sponsor from Dominos to Papa Johns. Papa Johns then announced that there would be discounted pizza for every grand slam hit, right around the time that people began to notice the spike in home runs. Coincidence? Probably, but still kind of interesting. Jeff Sullivan: Take that, Papa Johns! THE Average Sports Fan: What does Harvey need to do between now and trade deadline for the Reds to get something of value out of him? FearAndLoathing: Is a Garret Richards rebound going to happen? what would it look like stat wise? 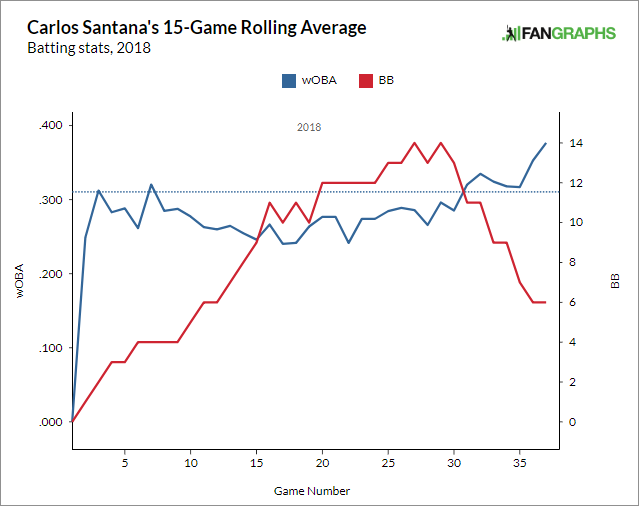 His xfip is great, but he’s rocking an elevated hr/fb rate (19.2 %), twice his career average, and he’s walking guys more. Gest : What possible adjustment do you think there might be for pitchers to make to Acuna? Lunch Angle: I’ve been to day games at Camden Yards and Nationals Park recently, brilliant sunny days, and all the lights were on. Why?! Rob: I’m pleasantly surprised by the Brewers so far, nothing great but nothing terrible. Do they have the talent to hang with the Cubs/Cards? I feel like their bullpen is their strength that could keep them in it. Vader: OK Jeff, what’s your expert opinion on whether or not the Jays should bring up Vlad, Jr.? Dev: The other day I was thinking of unique player skillsets and I came up with this question for you: who is the last notable hitter you can think of who had a ton of power and above average defense with absolutely nothing else to offer? Strike out and walk numbers are not impressive and not a great contact hitter, just a dude that can go yard and field. johnnyhobbes: is pat corbin a sell high right now? Jeff Sullivan: But it is a fun one! Blessed Be the Chatters: Is Starlin Castro an attractive July target or too much contract? Tim: The Marlins have already had four crowds of under 6,000 people this season. When is the last time a team had that many over a full season? Maybe the Expos towards the end? Put me in coach: What should the Braves do about 3B and Jose Bautista? It seems like they aren’t willing to give up what Machado would take, but Moustakas could be a pretty cheap addition. Tom: Is it crazy for White Sox or Padres fans to look at the Braves and think that could be them in a year or two? Joe: What the heck is wrong with Kole Calhoun? Belted: Mike Petriello recently suggested a benchmark counting stat of 5k ‘overall bases’ rather than 3k hits, for considering all-time great hitters. What are your thoughts on this? Do you have any other suggestions for more valid counting stats to measure career greatness? Yu: Is it possible Fangraphs ever starts showing some of the statcast batted ball data (launch angle, etc.) on a player’s page? sveum: What are Steven Duggar’s chances of getting to SF in the near future? What would need to happen? CamdenWarehouse: Quite a winning streak the Orioles are on. They’re going to show all of the doubters now! 2-D: The Phillies currently have zero left handed pitchers on their active roster. How much of a disadvantage are they putting themselves in? Ox: Should the Twins be more concerned about Berrios or excited about Romero? GraphsFan: Jeff, I really enjoy your sign off at the end of Friday baseball chat. Do you type it out longform or do you have it at the ready to be copy-pasted when you’re all wrapped up? Jeff Sullivan: But I’ve thought about it! Panik Button: Has Jeremy Jeffress really gotten this good? Or is there a fair bit of luck in there? Parts + Gleyber: Tillman’s last two starts: 2 1/3, 12 ER. Who would you start in that slot next time it comes up? Jeff Sullivan: For the 2018 Orioles, honestly, does it even matter? Ronnie: Who is the best CF you’ve ever seen? Has Trout done enough already to take Griffey’s spot on the Sullivan Squad? Another tough one for me is 2B. Do you take Utley’s all around game or Cano with the sweet swing & durability? Phaithful: Dallas Keuchel, uptick in velocity on everything. Just getting unlucky so far? Ryan: Hi Jeff. What are some websites or info that you use daily? Schmoo: Yonder Alonso reached out to Eno (which, the way I see it, is beyond cool). Which player would you most like to reach out to you? Bill G: Any insight into JBJ’s struggles? Ichiro: Thoughts on Luzardo…will he break into the A’s rotation this year? He’s pitching well so far. The Candy Man Can: Hi Jeff, have you ever looked at what velocity gain is the most important or indicative of future success? 92-94, 94-96, etc? Jeff Sullivan: But then, it depends on the explanation. Is the pitcher stronger? Does he have more efficient mechanics? Jeff Sullivan: There are just so many players doing interesting things. It’s hard to give them all their due. Like, there’s Pillar, but there’s also Teoscar Hernandez and Yangervis Solarte. Ahhh! NotBurtReynolds: In Zack Eflin’s first 2 starts, he has seemed to dramatically change his pitch mix. Could this be a case of a change in approach leading to a sustainable breakout? Or is it 2 games? Phaithful: What’s up with Zack Godley? Is he just returning to earth and the past 2 years have been lucky? Mr. Gibby: Read the article on Franco on the Athletic. Fantastic. He’s not he same player. Tommy N.: What are teams doing to Christian Villanueva for this prolonged slump? I’ve notice fastballs inside a lot lately anything else? Syndergaardians of the Galaxy: It seems like every year or two I’ll see an article about a team getting caught batting out of order, as the Mets did recently. Is there anywhere that these are kept track of,like the way that there are sites that list all known no-hitters? Vader: Do you see anything that makes you think Darvish can’t be his old self, or at least a solid NL pitcher? Stevil: Seattle might have the best LHP in baseball right now, but they’re struggling with their LHH left fielder. What might they do about that? Tim the Tool Man Taylor: Is the humidor really killing Paul Goldschmidt? Just a slump? or a decline in skills? Bill G: Hi Jeff. I would appreciate your opinion of baseball in Portland. Do you believe the population will support it? Thanks. We hoped you liked reading Jeff Sullivan FanGraphs Chat — 5/11/18 by Jeff Sullivan! This also works if you need a good baseball pun name for when you get a rollaway bed at a hotel. I always name mine Jim Cot.